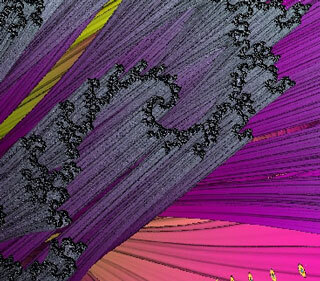 "A Volume of Julia Sets" is an exploration of a fractal which is composed of planar two-dimensional Julia sets stacked on top of each other. Each plane is determined by a real and imaginary constant. The constants specifying the stack form a straight line that passes through the origin. The animation is created by rotating the straight line in the constant space using camera moves and a cutting plane.